Madeleine Park was well known for her portraits of dogs and horses, she did many such works commissioned by the owners. Here is a fine early work of a draft horse stallion, he is most likely a Percheron. 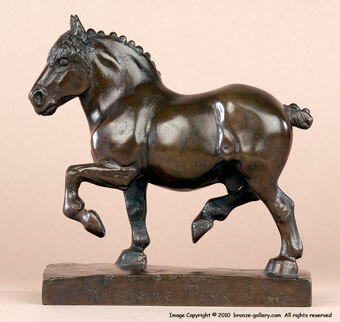 The Percheron is not often found in sculpture and Barye's Percheron is probably the best known bronze of this draft horse breed. Madeleine Park's model is true to life showing a well muscled powerful stallion with his neck arched. 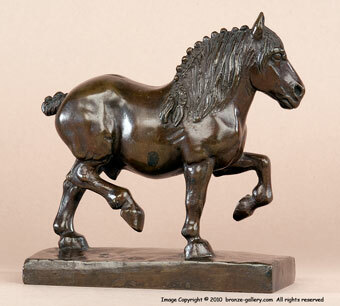 This fine small bronze was cast by Gorham Foundry, and is stamped GORHAM CO FOUNDERS QJGZ and dated 1937, it is finished in a rich dark brown patina. This sculpture was exhibited at the Studio Guild in 1939, and at the National Sculpture Society in 1951. A rare model by a talented American woman sculptor whose works do not come on the market often, this would be enjoyed by any collector.